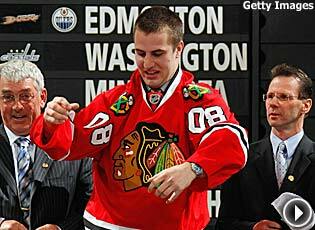 Despite possible injury concerns, the Chicago Blackhawks did not hesitate to nab talented power forward Kyle Beach with the 11th pick in the 2008 NHL Entry Draft. OTTAWA – Kyle Beach was one of the more interesting candidates entering the 2008 NHL Entry Draft. His talent was obvious, evident in the 27 goals, 60 points and 222 penalty minutes in 60 games with the Everett Silvertips of the Western Hockey League. Those totals earned him the No. 7 rating among North American skaters in NHL Central Scouting's final rankings. But there were other issues surrounding Beach, including a pair of concussions and May hernia surgery that kept him off the ice until just recently. So where exactly Beach would go on draft night was one of the major questions of the 2008 selection process. The answer turned out to be to the Chicago Blackhawks at No. 11. A 6-foot-3, 203-pound power forward, Beach becomes another piece in a rapidly growing arsenal of young talent being put together in the Windy City. "We're not taking a chance by selecting him," said Blackhawks General Manager Dale Tallon. "We really like him. He's a big power forward who has great hands and a great shot. He's also got a lot of edge to him, and he's going to fit in very nicely. We needed this type of power forward. "He's a kid that has got tremendous strength, particularly with his wrist shot. He's also got an ability to put fear into the minds of his opponents. He's just terrific on the power play because he has got a cannon for a wrist shot." Beach couldn't have been happier to land in Chicago. "It's an Original 6 team," said Beach. "They're young and they've got a bright future ahead of them. It's almost a new team here with how young they are. They have a great team with Patrick Kane and Jonathan Toews, Brent Seabrook. They're looking to move forward and I'm glad to be part of it." To get to Chicago, Beach first needs to get fully healthy, and then work on his skating. "I know I need to improve on lots of things," he said. "One thing is definitely my skating. Once I get going I'm fine, but getting up to that has been a bit of a challenge. It's one thing I'm going to focus on this summer. By the time I get to training camp, I don't think it'll be a problem." Beach plans on making it a problem for the 10 teams that passed on him. "Going to the Chicago Blackhawks gives me the perfect opportunity," he said. "It's a great honor. I feel they'll surround me with the support I need and the help I need for the future and moving forward. "I look forward to going out and having that opportunity to prove teams wrong that passed on me."